Alternanthera reineckii is a gorgeous stem plant that is available in many cultivars, suitable for different ornamentation. The “rosefolia” form tends to grow tall for back or midground, and “mini” tends to stay low and carpets the foreground nicely. Known more commonly as “Telanthera”, this species has red stems and lovely red leaves. Coloration is exaggerated with high lighting with good red/blue spectral emittance, regular fertilization, and a soil-based substrate. If habitat requirements aren’t exactly ideal, they often survive, though their leaves will shed and turn green. 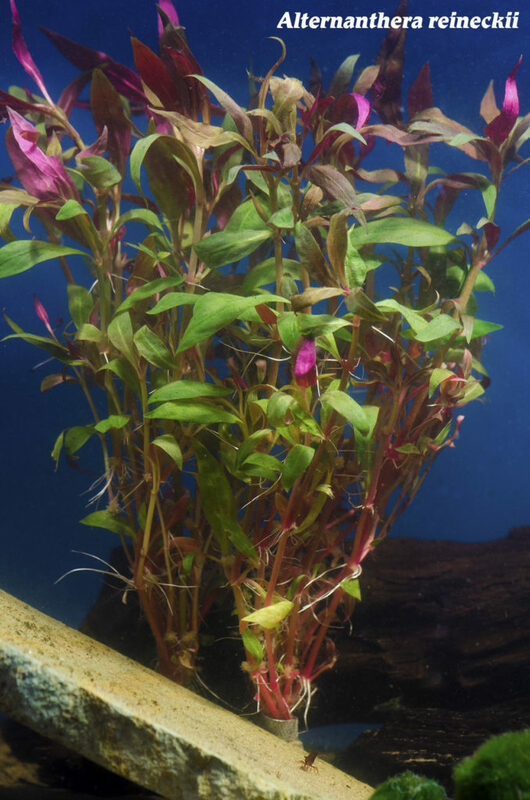 At The Wet Spot Tropical Fish, the “Rosefolia” form is available as bare root stems and can be planted directly into the substrate. They are extremely easy to propagate and can be trimmed at growth nodes sprouting roots, and replanted. The “Mini” form is available as a tissue cultured offering. Tissue cultures are grown in a sterile gel matrix which guarantees the plant is free from snails, algae, and pesticides. To use, rinse the gel off the plant roots with water and plant in the substrate. This form will also propagate with lateral shoots and can be trimmed and spread as desired, or left to form a carpeting clump on its own. This plant is flexible with regards to water temperature, hardness, and CO2. Telanthera does best in a temperature range of 72 to 78°F, pH between 6.0 and 8.0, and hardness around 60 to 142 ppm.